Something that has been taking up some of my creative time and energy these days is music. Good ol’ Rock & Roll music. Music to get your heart beating and your feet moving. Music that makes you want to dance your …..er…..you know, off. I hear all the time from the parents of my students that they wish they had the opportunity to be in a band when they were a kid. That they regretted not learning an instrument. After all, who didn’t, at one point or another, dance around their bedroom when they were a kid, singing into their hairbrush, wishing they were Pat Benatar or Robert Plant? I know…I’m dating myself. Could be worse. I could have been forced to write Britney Spears and Eminem there instead. Yikes. The thing that usually follows is these parents saying “But it’s way too late now.” One word……WRONGO! This is my bass. The one I started learning to play when I was 42 years old. Yes…..42. Other than some piano lessons when I was a kid, I’d never played an instrument. Thought I was incapable of playing an instrument. Hah! I was wrong!! So now I play bass in a Rock & Roll band with my husband, Scott Irvine, and Erich Schmidt. We’re called Nightshade. It’s seriously the most fun you can have. Nothing, and I do mean nothing, feels like playing music for other people. I think I understand now why so many famous musicians become addicted to drugs and alcohol. I think on some levels they’re looking for that feeling you get when you’re playing music for other people. It’s amazingly fun on the small scale I’ve done it….I can’t begin to imagine what it must feel like to play to massive stadiums full of people. It must be truly intoxicating. Something we’ve noticed lately is that there’s not many places that play live music and have a dance floor. Bars have pool tables and clubs play canned hip-hop. We grew up going to clubs and bars where there was ALWAYS a band. If the music was canned, it was always a disappointment. We miss that. We’ve chosen our songs with an eye, or ear, to what is danceable. Songs that make you want to move. Beats that make you want to boogie. So even though this is a busy season, cut yourself a break. Take some time for yourself. Put aside all the office-party politics and the family dinners. 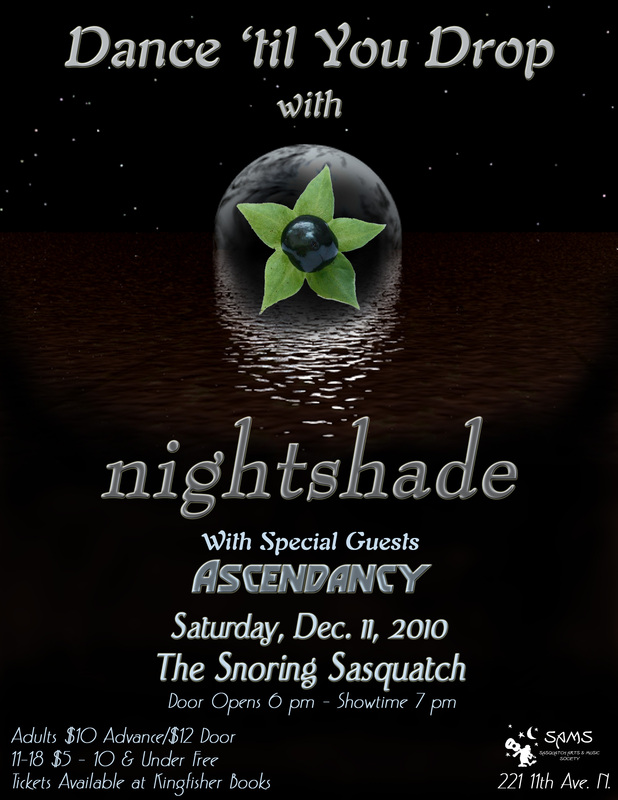 Come on out on December 11th to the Snoring Sasquatch. Do it cause it’ll be a ton of fun and you wanna…..you know you really wanna……Dance til you Drop!